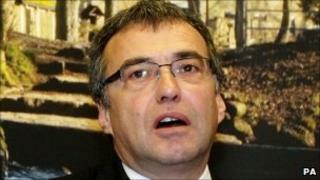 Three High Court judges considering former Labour MP Phil Woolas's bid to overturn his ban from politics have reserved judgement. Mr Woolas retained his Oldham East and Saddleworth seat in May, but the result was declared void by a special election court over his conduct in the campaign. The former minister sought a judicial review to challenge the verdict. The judges said there were "difficult questions to resolve" and a judgement might not come before next week. Lawyers for Mr Woolas argued during the two-day hearing that the election court's interpretation of the law was flawed. The judges also have to decide if they can hear a fast-track application for judicial review. It is thought both judgements will be made together. Last week the High Court ruled Mr Woolas could not seek a judicial review, - because the election court was a court of High Court judges sitting in their capacity as High Court judges. It said he could go to the Court of Appeal. Mr Woolas's legal team have sought to argue that the election court is "inferior" to the High Court and that its decisions could be the subject of a judicial review. Although Mr Woolas is officially no longer the MP for Oldham East and Saddleworth, a by-election has not yet been called while legal proceedings continue. The election court ruled on 5 November that Mr Woolas had made false statements in his campaign to hang on to his seat. It heard that Mr Woolas stirred up racial tensions during a campaign which saw him win by just 103 votes over Lib Dem candidate Elwyn Watkins. It found that, although made in the context of an election campaign, comments in campaign material suggesting Mr Watkins tried to "woo" the votes of Muslim extremists clearly amounted to an attack on his personal character and conduct. The court ruled he was guilty of breaching the Representation of the People Act 1983 and barred him from standing for elected office for three years. Mr Woolas's legal team have sought to argue that the ruling should be subject to a judicial review. If they get one, they want senior judges to rule that the election court misdirected itself in law, when it found that Mr Woolas had made attacks on his Lib Dem rival Elwyn Watkins' "personal character or conduct" with "no reasonable grounds for believing them to be true, and did not believe them to be true". They argue that the statements were about the "political conduct" of his Lib Dem opponent - not his personal character - and suggest the election court's interpretation was inconsistent with free speech. But Mr Watkins' QC Helen Mountfield argues that Mr Woolas's campaign strategy was "of the basest kind" in an area which had seen race riots in 2001 and it was "no part of the law to protect freedom of expression where that freedom is abused to make one section of the community angry about, and fearful of, another on the basis of falsehoods".